Should we believe him? I believe we should, and now I’d like to tell you why. Paul Manafort, Roger Stone and Donald Trump have all kept a close inner circle over the years. Because of this, I believe the timeline of their activities is crucial to understanding their actions. So, I’m starting with a plot of the career trajectory of Manafort, Stone, Trump, their numerous associates and anyone else in their business or political orbit. There is some overlap with the Part 3 timeline, but most of this is new. 1985: Donald Trump purchases his Mar-a-lago club, located in Palm Beach, Florida. 1992: Semion Mogilevich sends his lieutenant, “Yaponchik” to live in Brighton Beach, New York. Later that same year, the FBI found Yaponchik living in Trump Tower. 1995: Jeffrey Epstein creates ‘Ghislaine Corp.’ in Palm Beach, Florida. Robert Maxwell’s daughter, Ghislaine Maxwell, is Jeffrey Epstein’s longtime girlfriend and alleged pimp. 1995: Semion Mogilevich attended a summit meeting of Russian OC figures in Tel Aviv, Israel, from October 10–19, 1995. Participants included Sergei Mikhailov, Viktor Averin, Boris Birshtein, Vadim Rabinovich, Leonid Bilounov,-and Arnold Tamm. The subjects met in Boris Birshtein’s office in the diamond center of Tel Aviv. The subject of the meeting was the sharing of interests in Ukraine. 1996: According to the New York Times, A grand jury was empanelled to investigate Ron Lauder in connection with at least $1 million in bribes to Ukrainian officials for TV rights there. The payments examined took place in 1996. Vadim Rabinovitch was part of the investigation, and this was less than a year after Rabinovich attended an organized crime meeting in Tel Aviv, headed by Semion Mogilevich. Notice the subject of interests in Ukraine came up in that meeting, seen below. 1996: Paul Manafort worked as the RNC convention manager for Bob Dole’s presidential campaign. The RNC head at the time was Haley Barbour (whose law firm now works on Russian Oligarch Oleg Deripaska’s visa issue). 1996: “Arthur’s Boy’s” work on Bob Dole’s presidential campaign. Arthur Finkelstein eventually works with the campaign alongside Roger Stone, Paul Manafort, Alex Castellanos and others. 1995/96: Ron Lauder introduces Benjamin “Bibi” Netanyahu to Arthur Finkelstein, who plays a key role in Bibi’s election victory that year. 1999: Konstantin Kagalovsky’s mentor, Anatoly Chubais, was expected to back Putin’s run for president the next year. 2000: Semion Mogilevich is spotted in a video taken at a campaign office for Putin’s presidential election campaign. 2000: Vladimir Putin’s first term as president begins in May of 2000. 2000: Bob Dole begins work for Russian Oligarch Oleg Deripaska on his visa issue. No later than 2001 (reports are unclear of the exact date) Paul Manafort is hired by Dole to work on this same visa issue. This work continues for several years. 2004: Viktor Medvedchuk and Paul Manafort are in Ukraine to work for the presidential campaign of Viktor Yanukovych. Medvedchuk is on tape altering vote tallies rigging votes. I explained Medvedchuk’s significant in greater detail in Part 3. 2004–05: Orange Revolution in Ukraine, after election tampering is discovered. Paul Manafort remains in Ukraine and works to rehabilitate the image of the pro-Kremlin candidate Viktor Yanukovych. 2005: Digital Sky Technologies (DST Global) founded on January 1, 2005, by Yuri Milner in Hong Kong. 2006: Dmitry Firtash admits RosUkrEnergo and Gazprom are closely tied together. Firtash also linked to a business relationship with Russian mob ‘Boss of Bosses’ Semion Mogilevich. Firtash denies working directly with Mogilevich, but he has “admitted to asking permission from the mobster before conducting business in Ukraine as early as 1986.” However, he’s on tape admitting that he had to ask permission from Semion to begin his work in the energy sector in Ukraine. 2006: Manafort is hired by Oleg Deripaska and paid $10 million a year to improve Vladimir Putin’s image with the west. 2006: Bayrock listed Felix Sater as a managing director (as well as senior advisor to Donald Trump and The Trump Organization at various points) when construction of the Trump SoHo began in 2006. 2007: Bayrock listed Alexander Mashkevich as a ‘source of financing’ for Trump development projects, including Trump SoHo. Mashkevich was accused by Belgian authorities of being involved in a 2011 in a $55 million money-laundering scheme. 2008: Paul Manafort partnered with Ukrainian Oligarch Dmitry Firtash and Russian Oligarch Oleg Deripaska in a New York real estate deal. The key individuals in the petition included: Rick Davis, Rick Gates, Paul Manafort, Alexander Balanutsa (Party of Regions) and Konstantin Kilimnik. 2008: Trump announces he is partnering with Russian oligarch Pavel Fuks to license his name for luxury high-rises in Moscow, St. Petersburg, and Sochi. 2008: Russian oligarch Dmitry Rybolovlev purchased a Trump property in Florida for massively inflated rate but never actually lived there. 2009: Yuri Milner of DST Global is the lead investor for $180 million stake in Zynga “for social games on Facebook”. This same year, DST also invested over $200 million in Facebook itself. 2010: Rick Lazio releases an anti ‘Ground Zero Mosque’ ad as part of his 2010 campaign for governor. The ad campaign is financed by Robert Mercer, and the account lists a $40,000 payment to Arthur Finkelstein, Lazio’s consultant. Jan 2011: DST & Goldman Sachs invest $500 million in Facebook. The bank helped raise another $1.5 billion for Zuckerberg. 2011: Steve Bannon meets Donald Trump. July 2012: Rusnano became part of the “Skolkovo Innovation City” which was started by then Russian President Medvedev (now PM under Putin). Oct 1 2012: Mark Zuckerberg met with Medvedev near Moscow & discussed a “plan for a Facebook research centre in Russia.” The same day that Zuckerberg met w/ Medvedev, Russian Internet search engine Yandex, launched its own browser. 2012: The Global Brain Institute (GBI) is founded. This was made possible thanks to a grant from the Yuri Milner Foundation intended to stimulate research on the Global Brain. Dr. Ben Goertzel joins the board of GBI. March 2012: Steve Bannon becomes executive chairman of Breitbart News. 2013: Mark Zuckerberg launches a new political advocacy group consisting of top leaders in the tech industry that will lobby for federal legislative reform on issues ranging from immigration to education. One of the consultants Zuckerberg works with is Jon Lerner, a protege of Arthur Finkelstein. 2013: According to H+ Magazine, New York science investor, Jeffrey Epstein, has backed H+ board member Ben Goertzel’s OpenCog Hong Kong based research group. 2015: Kaspersky Lab paid former national security adviser Michael Flynn $11,250 in 2015 for cyber-security consulting. 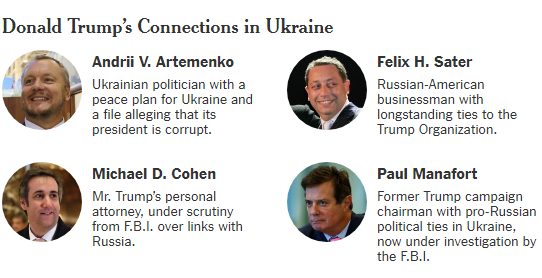 2015: Paul Manafort continues to visit and work in Ukraine, even after the ouster of his former pro-Putin client, Viktor Yanukovych. August 2015: Steve Bannon claims he’s Donald Trump’s actual campaign manager in an email to his former Hollywood colleague. 2015: Felix Sater and Donald Trump’s personal lawyer, Michael Cohen, work together on a Trump Tower Moscow deal. Donald Trump signs a letter of intent on the deal in October of 2015. 2016: On March 29, 2016, Paul Manafort joins the Trump campaign. 2016: The Yandex meta tag was added to the Breitbart News website between March 30th and March 31st, 2016, at the height of Republican nomination campaigns. 2016: On May 17th, GRU hacker Rinat Akhmetshin meets with Putin’s favorite Congressman, Dana Rohrabacher. 2016: On August 17th, Steve Bannon becomes Trump campaign CEO and Kellyanne Conway promoted to campaign manager. 2017: In January, Felix Sater helps craft the pro-Kremlin “peace plan” for Ukraine with Andrii V. Artemenko. There are reports that Viktor Medvedchuk was involved as well. The document was given to Trump’s personal lawyer, Michael Cohen, by Felix Sater. Cohen then delivered them to Mike Flynn’s office, a week before Flynn resigned as national security adviser. 2017: According to Reuters, on May 29, 2017, Ukraine’s State Security Service (SBU) raided the Kiev and Odessa offices of Russia’s top search site Yandex on Monday, accusing the company of illegally collecting Ukrainian users’ data and sending it to Russian security agencies. In Part 1, I mentioned “Arthur’s boys” on Bob Dole’s 1996 presidential campaign. Roger Stone, Alex Castellanos and Tony Fabrizio were all part of that group, and all three worked for Donald Trump’s campaign in 2016. However, in this piece, I’m going to focus on Roger Stone’s business partner in Black Manafort Stone Atwater, Mr. Paul Manafort. Despite what you may have heard from Sean Spicer or Trump himself, Paul Manafort didn’t play a “limited role” in the Trump campaign. Here is a timeline of Manafort’s involvement on the campaign. You’ll not that Manafort officially joined the campaign on March 29, 2016, and he became campaign chairman on May 19, 2016. Even after he officially resigned from the campaign, Paul continued to be involved, even advising on the transition team. Paul Manafort was brought on in 2016 to fight off the Never Trump crowd at the Republican National Convention. Why? Because conventions are one of Manafort’s specialities. It’s why he was tasked with running the convention for Bob Dole’s campaign in 1996. Bob Dole, of course, lost the election, but his work with Manafort was far from over. In late 2000 or early 2001, Paul Manafort began assisting on this visa issue, and it continued until at least 2009. Regardless of when and how this relationship it ended, it went well enough that in 2006, Manafort was hired by Deripaska to “greatly benefit the Putin” government. Manafort was paid $10 million a year to lobby directly for Vladimir Putin, in order to improve Putin & Russia’s image in the US and other western countries. I mention this because it appears to be a difficult concept for the American media to grasp. They put the words “former” in front of KGB and GRU members who met and interacted with Trump and his associates as if it largely irrelevant to present day circumstances. It’s simply not true. Russian intelligence and the Russian mob should be viewed according to their own standards. There is no “former”, and the official story behind anything they do should never be accepted as fact without independent confirmation. There can be no denying that, even if Trump did win because of Paul Manafort, a lot of people helped along the way. The details will continue to be flushed out, and I think everyone researching and reporting the 2016 campaign is likely to take a slightly different angle. This is perhaps inevitable because there were so many moving parts involved. Steve Bannon and Breitbart played a part, as did Jared Kushner, Brad Parscale, Roger Stone, Aaron Nevins, Facebook, Twitter and so on. I could name off any number of people, but there has to be someone on the ground coordinating this effort. Whether or not Paul Manafort was the most technologically gifted campaign member is largely irrelevant. Manafort was Trump’s campaign manager, and his work history in Ukraine tells us he was technologically proficient enough to manage and coordinate the data aspect of the campaign. Managing the operation requires a different skill set than actually operating the technology itself, and Manafort was more than capable of overseeing these efforts. Perhaps that’s why Manafort received $20 million in loans after he, officially at least, left the Trump campaign. Paul worked closely with, at least, two Russian intelligence officials in Ukraine — Viktor Medvedchuk and Manafort’s assistant, Konstantin Kilimnik. Manafort worked with Kremlin propaganda there to help elect a pro-Putin candidate, which, we now must admit, is exactly the situation we saw in Donald Trump’s campaign. If that seems like a far-fetched statement to you, it shouldn’t. Donald Trump worked toward building Trump Tower Moscow during his campaign (even signing a letter of intent), yet throughout the campaign lied about this. Time and again he said he had nothing to do with Russia, when we now know, with certainty, he did. We also know Russian money was used to plant ads on Facebook, and the Russians even used Facebook to plan rallies and events inside the US. Considering how much Russian money is invested in Facebook, it’s at least worth investigating if Zuckerberg either aided the Russians or willfully ignored any actions they decided to take. Mark’s frequent denials of this possibility don’t paint the picture of innocence. According to the New York Times, on November 21, 2004, Viktor Medvedchuk, the head of President Leonid Kuchma’s staff in Ukraine, talked to Yuri Levenets, a Yanukovich campaign operative, about CEC Chairman Serhiy Kivalov. They were found committing late-night manipulation of election data in the Ukrainian presidential election. Also involved in the plot to rig the vote in Viktor Yanukovych’s favor were Eduard Prutnik, Serhiy Lyovochkin and Serhiy Klyuyev. Now, this happened in 2005 (so it’s after the election that caused the Orange Revolution), but in this 2007 article in Ukrayinska Pravda we see that Manafort hired Aleksei Kiselev, and he is described as a friend of Eduard Prutnik. Eduard Prutnik, was described in the New York Times article as a key aide to Yanukovich, and he was directly involved with Viktor Medvedchuk in manipulation of data in the 2004 election in Ukraine. This was noted in the article I referenced above. One of the firms linked to Aleksei (sometimes Alex) Kiselev worked with Eduard Prutnik in the run up to the 2004 election in Ukraine. On November 8th, 2004, for instance Alex Kiselev interpreted for Eduard Prutnik at a press conference in Ukraine. Here is the FARA registration for Eduard Prutnik with Viktor Yanukovych, dated 11/19/2003. Here is the FARA registration for Alex Kiselev with Eduard Prutnik and Viktor Yanukovych dated 3/24/2003. Paul Manafort and his associates had a business relationship with Dr. Alexander A. Balanutsa by 2007 through Pericles Emerging Market Partners. You have to download the report, but you can also see here that Aleksei Kiselev’s work with Pericles started in 2007. According to The Daily Beast, Russian Oligarch Oleg Deripaska’s company also invested with Manafort in Pericles, and Pericles was set to be a prime investor in the Drake Hotel. Who else was involved in the Drake Hotel deal? According to NBC News, in 2008, according to court records, Manafort’s firm was involved with Firtash in a plan to redevelop the Drake Hotel for $850 million. Firtash’s company planned to invest more than $100 million, the records say. Who is the most common and recurring link between Firtash, Mogilevich, Deripaska, and Fred Trump’s former righthand man? Simple, it’s former Trump campaign chairman and Trump Tower resident Paul Manafort. I have yet to find the direct, “smoking gun” link proving Paul Manafort was behind the vote rigging in Ukraine’s 2004 election. However, even though Paul officially began work in Ukraine in 2005 and continued there until 2015, he never registered as a foreign agent (as he was legally required to do). Consider the amount of work Manafort did from 2005 onwards with the men involved in the 2004 election rigging. Also remember that Manafort’s allegiances did not shift. He began work with Oleg Deripaska in 2000–01. He was introduced to Yanukovych by Deripaska. Manafort began to work with Putin directly in 2006, and Paul continued to work for Yanukovych until 2014, when he fled Ukraine and began living in exile in Moscow. How far back to Manafort and Abramoff go? Doug Bandow was a special assistant to President Ronald Reagan. Guess who else worked for Reagan? Black Manafort Stone & Atwater did. So did Jack Abramoff. Where else did these two groups intersect? According to Daily Kos, “What is proven is that Charlie Black and Jack Abramoff were working for the same client at the same time and that, that client was a murderous butcher named Jonas Savimbi.” That’s Paul Manafort and Roger Stone’s business partner at the time, Charlie Black. But don’t worry, Paul Manafort was there working for Savimbi too. What “disgraced influence king” recently tried to lobby the Trump administration? Jack Abramoff. When that didn’t go as planned, Abramoff got help from “paid by Putin” Congressman, Dana Rohrabacher. Another interesting revelation is that Ron Lauder, who I covered extensively in Part 3, survived his bribe scandal in Ukraine intact. He even maintained his media possessions in Ukraine well afterwards. In 2007, Lauder was listed as the controller of television channel Studio 1+1 in Ukraine. Lauder’s Central European Media Enterprises did not sell its Ukrainian operations, including Studio 1+1, until January of 2010. Why do I bring this up again? Because in the 2004 presidential election in Ukraine, Lauder’s Studio 1+1 channel participated in the propaganda project against Viktor Yushchenko, who was the opponent of Paul Manafort’s client, Viktor Yanukovych. It seems quite likely that Paul Manafort was involved in at least some of the events in Ukraine leading up to the Orange Revolution in 2004. Why is it so difficult to know for sure? Because few Ukrainians are willing to speak out against the Kremlin on the record. The two countries are at war with each other, and there are Russian intelligence officers all over Ukraine. Even those who would like to speak out often don’t out of concern for their safety. Vladimir Putin has no qualms about murdering his enemies inside of Ukraine. Fear there always helps muddy the waters in the Kremlin’s favor. The Trump administration has tried quite hard to put distance from themselves and Paul Manafort for at least a year now, but there’s no reason any of us should buy the hype. Paul lived in Trump Tower by 2006, and he was Trump’s campaign manager for several months. His relationship with his former business partner, Roger Stone, remained strong in 2016, when Stone was behind Manafort joining the campaign. We know Russia interfered in the US election to help elect Donald Trump. Russian money paid for Kremlin propaganda ads to run on Facebook during the US election. The Kremlin even managed to stage events inside the US by organizing and promoting them on Facebook as well. Starting in 2009, Russians invested hundreds of millions of dollars into Facebook, and as I showed in my timeline, there are a significant number of intersections between Steve Bannon, Mark Zuckerberg and various individuals linked to the Kremlin. Zuckerberg’s partnership with Jon Lerner in 2013, for instance, is not far removed from Paul Manafort either. In November of 2016, Mark Zuckerberg said it was a “crazy idea” to think that fake news on Facebook influenced the outcome of the election. Even now, with what we know, Zuckerberg still refuses to be transparent with the public about what happened on Facebook during the election. After being proven wrong, Zuckerberg’s unwillingness to act appears to be, at best, motivated by a profound sense of fear. The how of the operation is a story that may take years to fully understand. Steve Bannon, Breitbart, Cambridge Analytica and Robert Mercer certainly were part of the operation, and Bannon’s history in the tech industry was another asset for Trump’s team. According to The Daily Beast, colleagues of Manafort say the Yanukovych campaigns Paul ran benefited from Russian bots. There is simply no possible way that Manafort was not well versed in the same kind of Kremlin propaganda the Trump campaign used in 2016. Manafort also, through his years of service for the GOP, had a direct line to the RNC. Blaise Hazelwood, who constructed the Voter Vault, the RNC voter file database, runs a Big Data company ‘Grassroots Targeting’ which worked on the Trump campaign. What’s the direct link? Hazelwood’s first job was for Bob Dole’s 1996 presidential campaign (while Haley Barbour was the RNC head). She also served as chief of staff to Reince Preibus at the RNC. This may at least partially explain what Reince Preibus was doing at Trump Tower on June 9th, the same day as the infamous meeting with Kremlin agents that Paul Manafort also attended. I discussed this meeting further in Part 1. So, the question remains, did Donald Trump win because of Paul Manafort? Well, if Paul Manafort and Russia didn’t play a big part in Trump’s win, why did Manafort struggle so much to deny a connection between the two during the campaign? It’s easy to poke fun, but I think Paul struggled because it’s an absurd statement to make. Donald Trump was helped by the Kremlin, and Paul Manafort was Putin’s point man on Trump’s campaign. Refuting any connection at all must have seemed, at the time, a laughable absurdity. Keep this in mind too. Paul Manafort was Putin’s employee for several years. If there are no “former” intelligence officers or mafia members in Russia, can “former” employees of the Russian government even exist? I believe this is a question worth asking, preferably under oath.